The Distinguished Young Woman of Carter County for 2019 is Christiaan Prince, from Grayson. 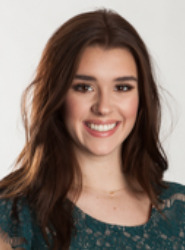 The Distinguished Young Woman of Johnson County for 2019 is Olivia Dale, from Flatgap. Coordinator at Kindergarten University at Paintsville Elementary School. • Dance Performances at elementary schools and nursing homes. • Packing shoeboxes for children through Operation Christmas Child. • Relay For Life tent coordinator and walk leader. • Spanish tutor for Spanish I and II students during school hours.